Maserati is hoping to recreate the buzz around the Jaguar F-Pace and Bentley Bentayga with its long-awaited SUV offering, the Levante. It’ll hit showrooms in the second half of next year, and these latest spy shots give us the best look yet. We were told last week by boss Harald Wester that a finalized version of luxury SUV will come to next year’s Geneva Motor Show in March, ready to go on sale soon after. The shift of assembly from the USA to Italy has been the main delay, as it was initially touted for this year. We asked Wester whether the upcoming Levante was the most important car Maserati had ever made, but he strongly opposed this, saying instead: “It is the biggest business opportunity”. He also said it would look significantly different to the initial 2011 Kubang concept. Wester refused to elaborate on exactly how it may look, but having reported earlier this year on a set of leaked official drawings, we were already aware the production-ready car was likely to inherit its toned down looks from other models in the range. Maserati’s CEO also declared the two-seat Alfieri sports car was in the pipeline, designed to sit alongside the existing GranTurismo and GranCabrio when it goes on sale in 2017. We first saw an Alfieri concept car at the Geneva Motor Show in 2014, but news had subsequently died down – with the brand focussing its efforts elsewhere. Wester told us the new Jaguar F-Type rival would be the final piece in the puzzle for Maserati’s rejuvenated product range. He ruled out a smaller SUV, though, hinting that might be better suited to sister brand Alfa Romeo. “You have to consider we are not alone”, he said. “You walk across the corridor and you will meet Alfa Romeo. We will not start everybody doing a bit of everything. It doesn’t make sense. Drawings of the new Maserati Levante have leaked ahead of the car’s reveal later this year. 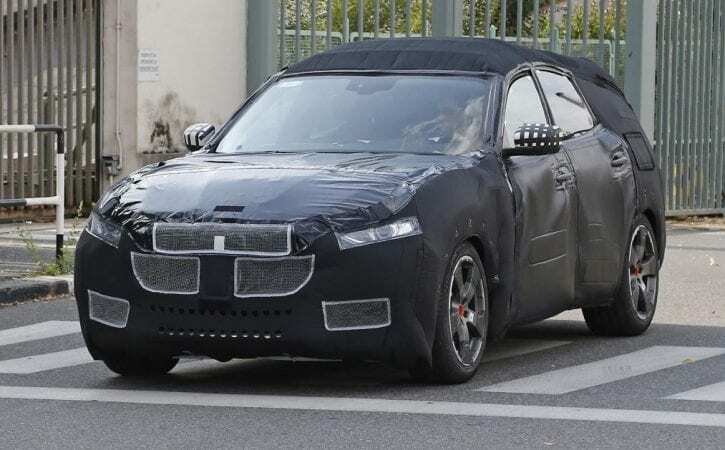 Last year, we learned the Levante would sit on a substantially altered Jeep Cherokee chassis – giving a raised ride height, long wheelbase and wider track. From the drawings, we can see the Maserati will feature a face inspired by the Quattroporte and Ghibli saloons, with a huge gaping grille and swept-back headlights. It looks rather like a Porsche Cayenne from the side, with a sloping roofline and high, sharp creases in the body. Also evident is the raised suspension, emphasising the car’s position as the brand’s first-ever SUV. Engines have already been confirmed as a pair of twin-turbo V6s and a top-spec V8 petrol. Three diesels, ranging from 247bhp to 345bhp, will complete the line-up. All Levantes will get four-wheel drive and auto gearboxes as standard.